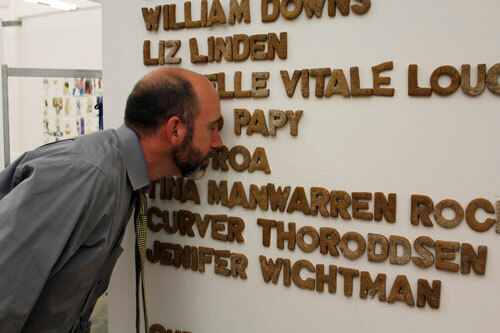 I couldn’t help but put together a stop-motion video of Jenifer Wightman installing her cookie piece, “Ephemeral Artist.” It was just so much fun watching the cookies pile up on the table and then get attached to the wall. Collective Consumption: Jeni Wightman from Random Number on Vimeo. Here is a photo of Jason Seder, from Agitators Collective (another group participating in Collective Consumption), sniffing the wall of scent. You’ll have to come to the exhibition to see the entire installation and smell it, in all its sweet spicy glory. Opens tomorrow (9/24, 6 pm – 9 pm). Sal Randolph has been giving away money in performances and installations for several years as part of her Money Actions and Free Money series . By giving away money she hopes to interrupt expectations, opening possibilities for new thought around questions of value and ownership. Her work includes interactions, conversations, and interventions, and often deals with gift economies and social architectures. 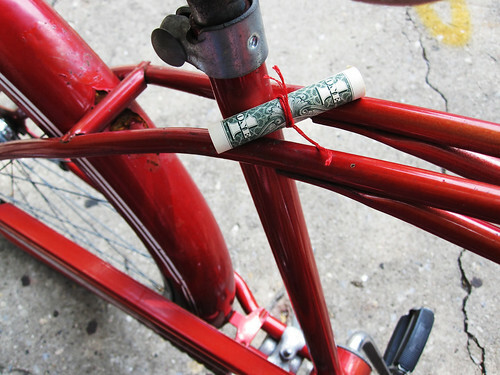 During The Case of the Curious Pedestrian, find $100 by hunting for dollar bills near the color red along Myrtle Ave. Look for red bicycles, fire boxes, signs, fences, t-shirts, even apples and you may discover a specially rolled dollar with a printed message enclosed. Dollars will be appearing along the avenue, indoors and out, between noon and 6pm. 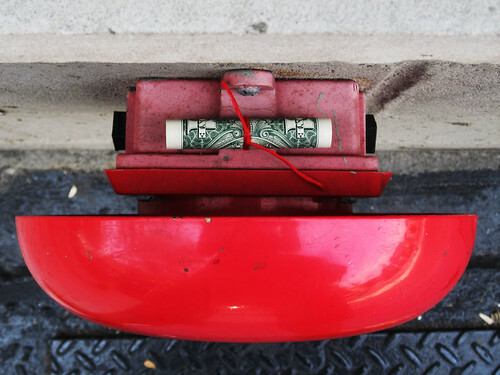 Try attracting dollars to you by putting out something red. Or take the opportunity to leave some of your own money for others to find. Ranjit Bhatnagar works with handmade instruments, found objects, and primitive robotics to make music machines and sound sculptures. For The Case of the Curious Pedestrian, Bhatnagar has modified vintage music toys to mimic the calls of local songbirds. These sculptures will be installed inside the awnings of Mr. Coco, Clinton Hill Express Deli, and Green in BKLYN–all located along Myrtle Avenue. Bhatnagar’s City Birds installation is perfectly suited to add to the “stumbled upon” sense that I would like to convey with the artwork selection and placement in The Case of the Curious Pedestrian. 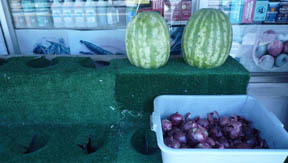 So too, is Angela Fan’s Watermelon O’clock, in which she made custom hats for the watermelons that are on sale outside of Benhadi Supermarket. It will be a clever and subtle intervention that is intended simply to make viewers smile. This September Claire Sexton and I will be presenting the group exhibition Collective Consumption at the Dumbo Arts Festival. 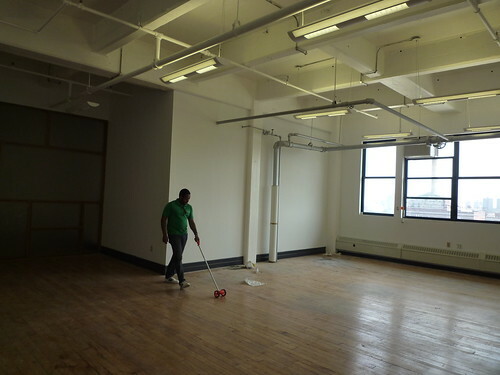 Two Trees and Dalzell Productions, the festival producers, assigned us the 20 Jay Street #1019 space and we are quite excited to fill all 1,750+ square feet of it with works by 12 artists and artist groups, including DoTank:Brooklyn, Michelle Vitale Loughlin, and Douglas Paulson, Christopher Robbins + John Baca, to name a few. Art in General recently asked me to write something about the work of Rancourt/Yatsuk for the AiG blog. The post is available through Art in General Production Notes, or you can keep reading here. I have the best life ever. This is the mantra that participants chanted during the Omega Club’s 2010 Annual Gathering, which took place on February 18, 2010 at the Austrian Cultural Forum. In their testosterone-fueled combination of motivational speaking and pyramid schemes, Rancourt/Yatsuk told us that we could achieve anything if we sold increasing quantities of Omega Juice. Omega Club from Rancourt / Yatsuk on Vimeo. Rancourt/Yatsuk extolled the benefits of their special juice in a three-step visualization exercise that included a histrionic call-and-response session, a reading of Frank McKinney’s bestselling self-help book The Tap, and a cloaked “elder” who looked like a disco version of the Grim Reaper. The characters, visibly agitated to a passionate frenzy by the conclusion of the performance, made it seem like the annual gathering could soon digress into a primitive state à la Lord of the Flies. I was on tenterhooks while watching from the second row, in fear of being forced to participate on stage. Luckily, on this evening Rancourt/Yatsuk had audience plants who played unsuspecting victims in their multi-level marketing charade, along with brave and willing audience members. I was safe from having to drink the juice and discuss my personal goals and shortcomings in front of everyone, but the threat of participation loomed until the very end. Rancourt/Yatsuk’s perfect balance between the unpredictable (am I going to get splashed with this juice? are they going to set the stage on fire?) and the familiar (they’re using the same upgrade tactic my phone service provider does) generates a satisfying tension in their performances. Even if you’ve suffered real life exposure to the archetypal characters that the duo portrays, their unpredictable actions offer sardonic commentary on the non-sustainable business models that have turned the American Dream into a farce. Their frame of reference is heavy-handed and manipulative PR lingo, used effectively to show how cynical the financial system of smoke and mirrors is. Having previously met Rancourt/Yatsuk at their Art in General exhibition, I knew that they mine the fertile territories of success coaching and speculative real estate investing for their performance-based works. In Phase IV, presented by Art in General in conjunction with Performa 09, they similarly employed false promises and a product of questionable merits to hoodwink their audience. In this intricately staged installation, visitors could walk around a ramshackle housing development, complete with a man-made pond and the sounds of the wild jungle on the outskirts of their prospective acreage. After leaving the gallery, interested parties could email Don Donavucci, the parasailor-turned-real estate agent, who might have responded with yet another killer land banking opportunity in southwest Florida. At a time when many are desperate to boost their financial health, this highly constructed portfolio option squarely places their work in the context of the present, and yet it would have felt relevant even if we weren’t still enduring the worst financial crisis since the Great Depression. Phase IV Trailer from Rancourt / Yatsuk on Vimeo. Rancourt/Yatsuk’s projects guide the audience through the absurdities and the contradictions of the modern world. Their greasy salesmen prey upon our desires and gullibility, but the scariest part is that they aren’t much different from actual people whose job it is to offer these inflated notions. While they sound like terrible investment opportunities, we are still riveted by the lifestyles these persuasive entrepreneurs are trying to sell us, whether it’s found in a juice that promises fame and fortune, a revolutionary life-cleansing program, or a poorly constructed single family house in a swampy section of the Art in General gallery. Random Number Multiples x 2!